Last week we created these adorable sloth Valentines for your kids to pass out to their classmates. 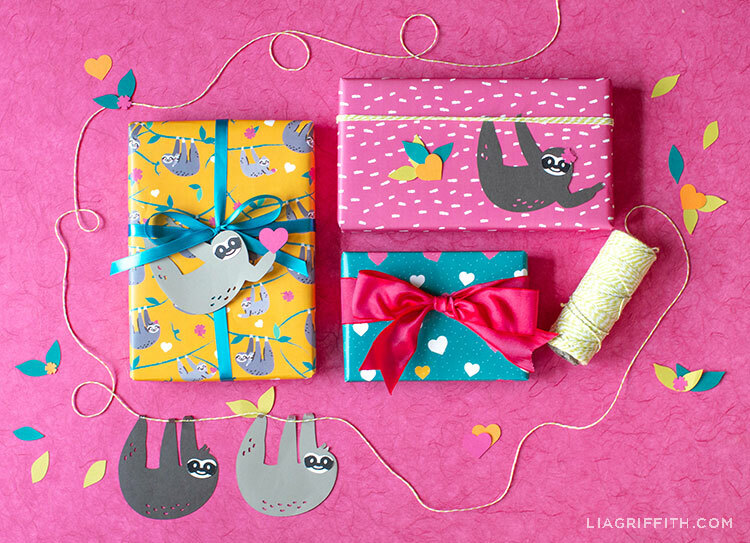 We also said we would have some more cute sloth crafts for you—and here is our next one! 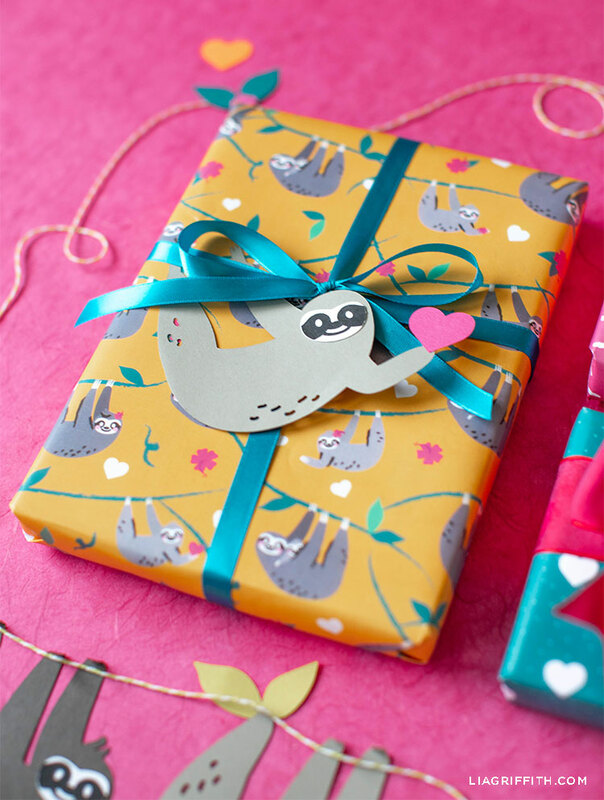 Our printable sloth wrapping paper features smiling sloths hanging from tree branches. It’s a great one to use for a kid’s gift or if your Valentine loves sloths. Of course, we also designed some other options for you if sloths aren’t your thing! No matter who you’re getting Valentine’s Day gifts for, it’s fun to make the outside match the thoughtful gift that’s inside. This is how we look at gift-giving anyway! You’ve taken the time to pick out a great gift, so why not take a little extra time to wrap it in a way that will surprise and delight the person getting the gift? It also gives you an opportunity to get creative with it! If you need some gift-wrapping tips, this video can help. Ready to wrap? 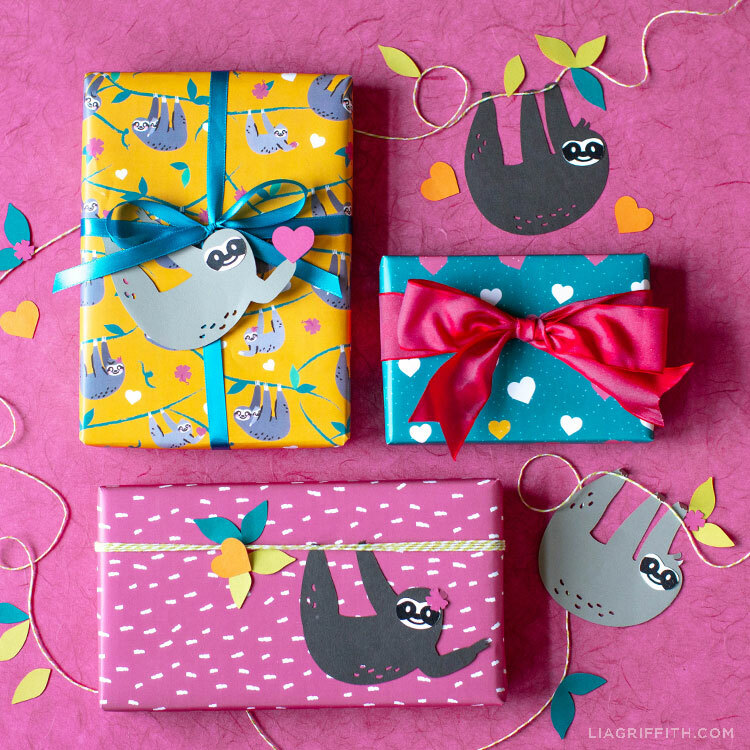 This printable sloth wrapping paper is ready to go. All you have to do is download the PDF at the end of this post and print it on white 11″x17″ paper. When you’re done wrapping your Valentine’s Day gifts, you can tie it with a bow and add a gift tag. If you like our sloth gift tags shown here, we’ll be sharing them soon, so stay tuned! Want More Simple Craft Projects? Browse all of our Valentine’s Day crafts on the site. Or you can also follow us on Instagram, Pinterest, and Facebook for daily DIY ideas and inspiration. If you’re a visual learner, check out our DIY video tutorials for making paper flowers, home decorating, and more. To download our DIY designs, templates, and tutorials, join our crafting community!